Today I saw the snowy owl that my son has been telling me that he sees on his drive to his highschool. This is only the second time I have ever seen a snowy owl, up close and personal and it thrills me beyond belief! I absolutely love birds of prey. I get pretty excited just seeing a hawk in a dead tree or on a hydro pole. 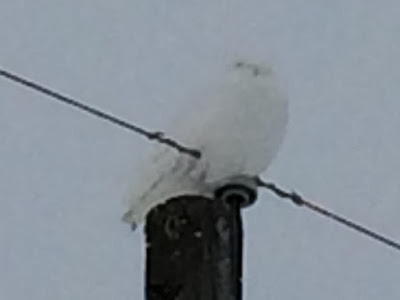 But a snowy owl?? Bliss. Getting a picture was a bit difficult. 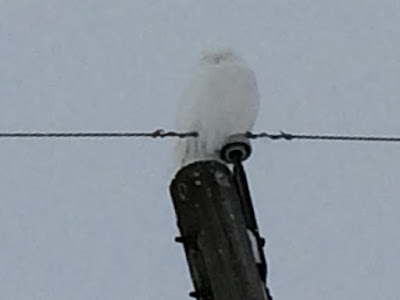 The sky was a whitish grey, it was snowing a bit, and the owl is white, so there wasn't much distinction. Add to that, I was using my phone to take the picture out my vehicle window. I was so happy that the owl did not fly away while I was stopped on the road trying to take its picture. These pictures were enlarged on my phone. It is a male snowy owl because there are no bars in its colouration. Snowy owls are different from others in that they hunt during daylight hours. They are native to Canada. I think this fellow had his eyes closed most of the time. It is difficult to see how big he is, but he was impressive. I got some good news today about a little health scare today, and I will take his appearance as a "good omen" (even though I'm not really into omens and things). Do you have owls where you live? O.K., Jeanie, I just finished Louise Penny's latest book, Kingdom of the Blind. The best part of the book was the end, not the actual ending, but the "Acknowledgements" at the end. Is this now really the last Gamache novel? There were a couple of events at the end of this book that disappointed me. I like characters to remain true and consistent. They are characters, not real people. Real people do sometimes take different directions and make unpredictable choices occasionally. The characters in Penny's novels, well I wanted them to stay who they were. Not my decision, however. If anyone else has read this book, please feel free to join in on a little impromptu book club here. Bring your own wine. My laptop died a bit of a death, so it's been a while since I've written my last post. I've had a look at other people's blogs and made the odd comment here and there. Seventy-five dollars later, my cursor no longer freezes and I no longer get spontaneously booted off wifi. I'm also no longer caught in a loop of windows recovery. I think it was money well spent. I have nothing exciting to report. I'm just busy with regular ordinary life, daughter is home from university for reading week, son is currently off at a big time basketball tournament, and we ate a variety of leftovers for supper tonight. I have no idea how people blog on a daily basis, but lord knows I've Pinned lists of blog post ideas you can write about to make your blog as exciting and captivating as possible. I did my first pulled pork in my Instantpot and it was succulent. The roosters "attacked" husband - he thinks it was due to red pants (don't even ask), but I"m not sure chickens even see in colour. Several nights ago, I was pleasantly fast asleep, but then wakened up by the sound of... coyotes! They were so loud I actually looked out the bedroom window, expecting to find them in our front yard. It was such an eerie sound. I rushed downstairs and asked husband, who is more of a night owl than I, if the cats were inside. They were, so we closed the cat door and kept them in. I heard the coyotes two more times that night. Now, I am going to go out in the dark with my flashlight to turn off the chickens' light and settle in for an episode of Coronation Street, and to keep reading my wonderful Louise Penny book - her latest called Kingdom of the Blind. I am intrigued and thoroughly loving it. 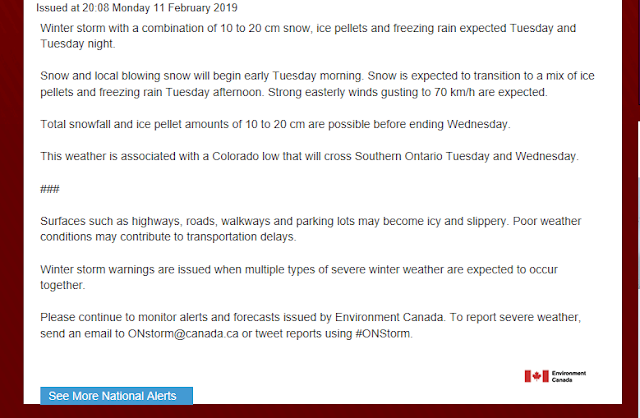 Here we go again, people. This is getting old. Our house is old. Probably not old by England standards, or France standards, or anything other than North American standards, but old here. We don't know exactly when it was built, but researching it is on my "what to do when I retire" list. It is definitely more than 118 years old. Yes, old homes can be charming. However, I just got done trying to treat mold around the windows and crawling up the outside walls on the upstairs landing. My basement is unfinished and a spider's dream. Some spots in the house have been renovated (by husband) but there are other parts where more insulation is needed, and we really need new eavestroughs, and it's hard to heat because the hot air doesn't flow well into individual rooms, and I'm pretty sure there are wasp nests in the wall behind the upstairs bathroom where they come in between the bricks and the soffits. The list goes on and on. Sometimes I dream of moving into a newly built, small house with enough closet space in each bedroom and doors that shut properly and a finished basement. Then I remind myself of how much work would need to be done in order to sell this place. Then I have a small cry. I have borrowed this idea from a couple of other bloggers, so thank you Thickethouse and Granny Sue for the inspiration!